Training Classes On Bonsai is an event that took place between 17-Aug-2006 and 20-Aug-2006 in Hyderabad. The Agri-Horticulture Association is conducting a 4-day Bonsai-training workshop at The School of Gardening, Department Of Horticulture at Public Gardens. The main focus is to give an idea to nature lovers as to how they can recreate popular trees to suit their domestic spaces. The Bonsai technique of horticulture is very popular upcountry, and this is an effort to introduce this very interesting form to people of the peninsula. The classes are from 11:00 AM to 02:00 PM everyday and the fee for the same is Rs. 350 per head. For further details, please contact the School of Gardening on 2329-9779, 5559-1474. 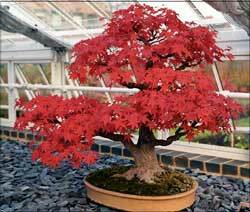 Be the first to comment on Training Classes On Bonsai! Just use the simple form below. fullhyd.com has 700,000+ monthly visits. Tell Hyderabad what you feel about Training Classes On Bonsai!